You all know how much I love my Big Beautiful Chopped Salads that I eat everyday for lunch. I have now created a new one that is so different and captures all the wonderful flavors of the Mexican and Southwest food that I love. It is still easy – peasy – which is the only way I cook these days. Although I have posted photos and descriptions of what’s in it on Instagram and facebook so many of you asked for a blog post and a video. Being the people pleaser that I am of course I decided to accommodate your wishes! 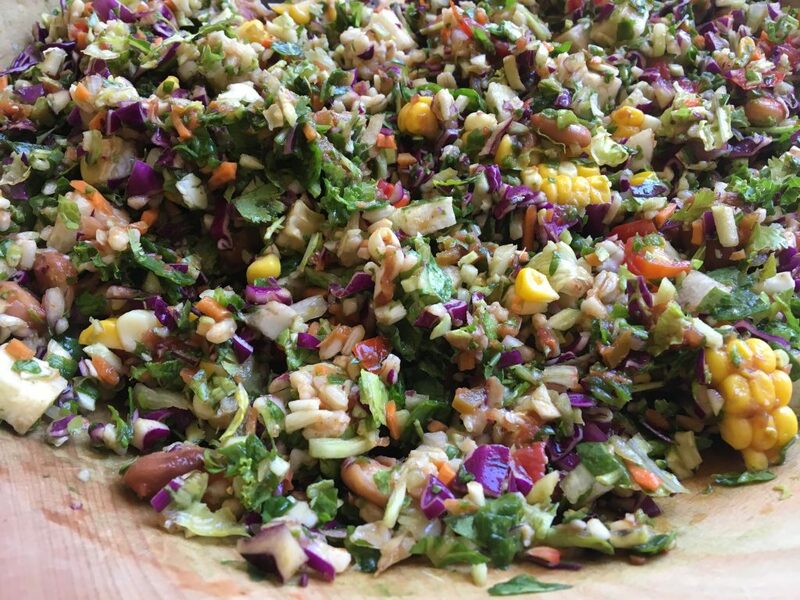 This salad is going to amaze you – so much flavor, crunch and super satisfying! 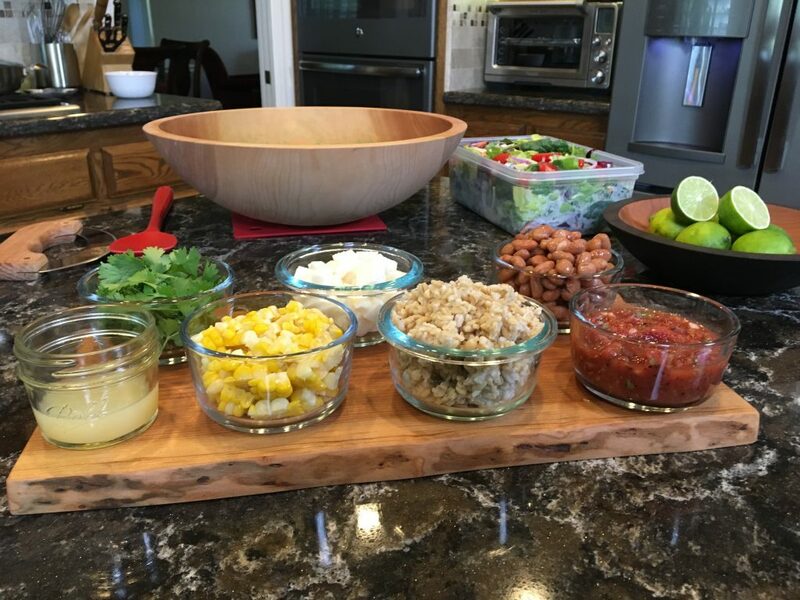 Click on the video to watch me make the Mexican Chopped Salad. 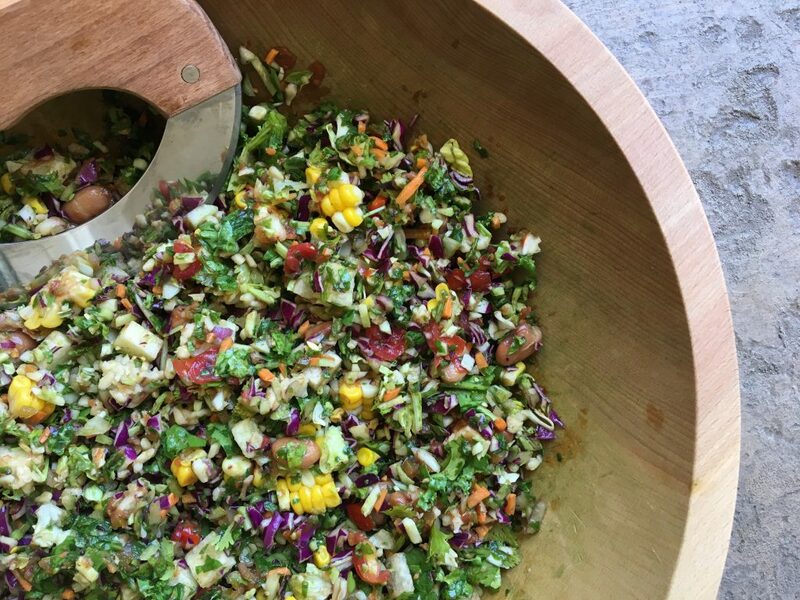 Be sure to use your favorite Salsa in this salad because that is going to be the main source of flavor. I have an easy salsa that you can make anytime of year. Tami’s Easy Red Salsa. You could also make a fresh Pico de gallo or use your favorite low sodium store bought salsa. My daughters Salsa Verde recipe is incredible and so delicious you won’t want store bought ever again. Plus when you make your own you control the salt and sugar! Don’t forget the fresh cilantro for another boost of flavor. If you don’t like cilantro try a little fresh Italian Parsley. Remember that this is just one idea for how to make this salad. Substitute your favorite ingredients and customize the salad to your personal preferences. Recipes are just an idea to get you started and then you can modify depending on personal taste and what you have in your fridge. Experimenting with your food is so much fun! I like to use Oat Groats in my salads and I cook them in the Instant Pot electric pressure cooker so they come out like brown rice. They are so amazing cooked this way. Of course you can use brown rice or quinoa too. Jicama adds a nice crunch and you might also like this Chili Lime Jicama as an appetizer or snack. Black beans or pinto beans work well in this salad. Try this wonderful Slow Cooker Beans recipe. It is a super popular recipe with my readers and it works with black or pinto beans. We love to cook our Corn on the Cob in the IP so be sure to watch my You Tube Video on how to do that. You can also cook it in an Air Fryer so check out my Breville Smart Oven Air blog post and video for all the details. 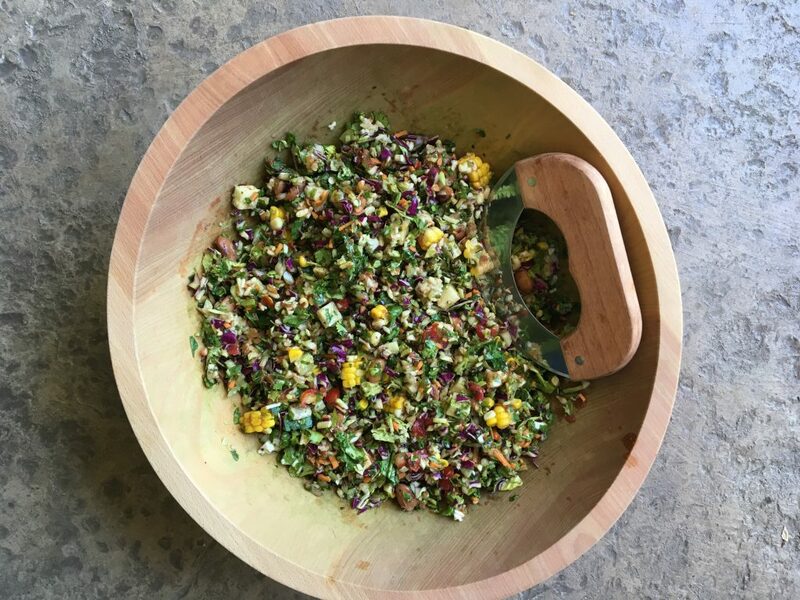 If you want to see how I Batch Prep Big Beautiful Salads each week check out the blog post and video where you can see how it’s done. Shown in the photo above is the Live Edge Presentation-Cutting Board from Holland Bowl Mill. It’s perfect for putting little dishes of condiments on and makes for a pretty presentation. If making sushi rolls or fresh spring rolls you can lay out ingredients on it as well. Presentation is so important with our meals – the more appealing it looks the more we like it! Lime is essential – it adds a bright fresh flavor and moisture to the salad. I just love this 9 inch Ebonized Cherry Wood Bowl. It holds my citrus fruits most of the time. Limes and lemons at room temperature are easier to juice than cold ones. The bowl shown in the video and here on the blog is from the Holland Bowl Mill in Holland Michigan. 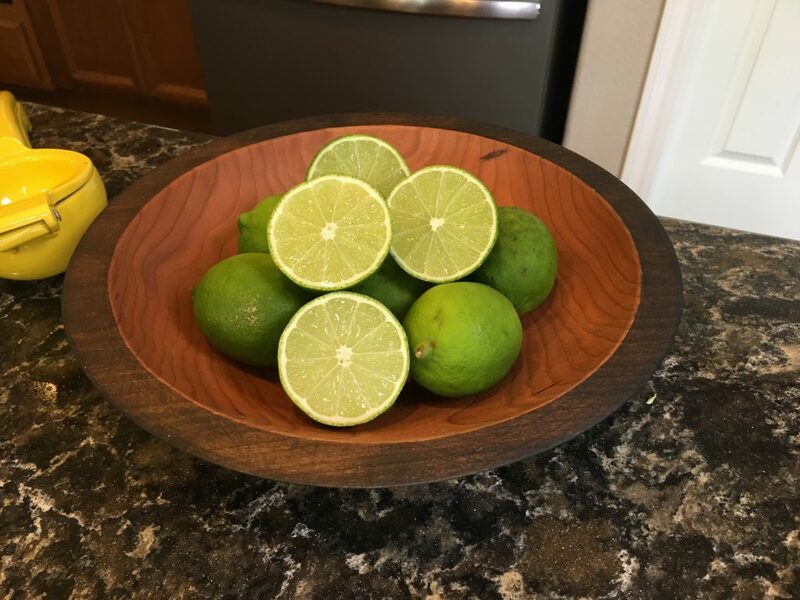 The bowls are made from one piece of hard wood, have a lifetime guarantee and can be engraved on the bottom. I am an affiliate with the company and when you order from them using my Holland Bowl affiliate link you will recieve a free mezzaluna knife with a minimum $125.00 order. When you place your order through my affilate link they will automatically include the mezzaluna knife when your order is shipped but it won’t show up on your order when you check out but it will be in your box when your bowl arrives. When Holland Bowl gets your order and sees that it came through my affiliate link with a minimum order of $125.00 they will automatically include a free Mezzaluna knife when they ship your order. You don’t need any code just be sure to use my affiliate link above. When you enter the site click on the Shop tab and you will get a drop down menu, click on the type of wood you would like your bowl to be and then find the 15 inch size bowl. I use the 15 inch solid Beechwood bowl to chop my salads. You can also purchase bowls made from cherry, maple, red oak and walnut! I don’t recommend anything smaller than a 15 inch if you want to chop the same size salads that I make. You need the 15 inch bowl to keep all the salad in the bowl when you are chopping. They offer free engraving on the bottom of the bowl too so be sure to customize your bowl! When you use my affiliate links you help support the work I do here without any extra cost to you. Thank you for your support! 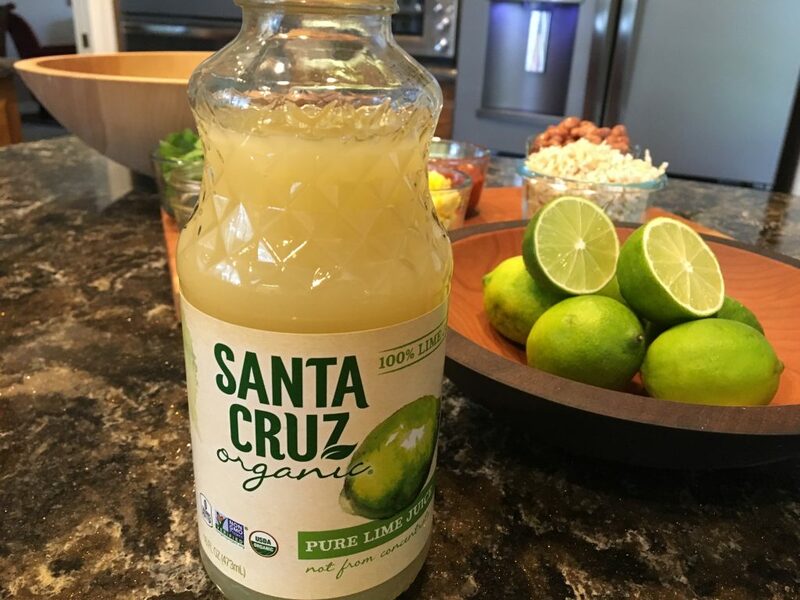 I keep this bottled organic lime juice on hand for when I run out of limes or sometimes the limes I have aren’t real juicy. I buy it at Whole Foods. It is shelf stable until opened and then needs to be refrigerated. Chop the salad greens and the cilantro to desired size. Add the rest of the ingredients and mix it well. I want to let everyone know that we are in the process of giving the blog a new look and moving it to a new server. The hope is that this can be done without interrupting anything here or going off line for any length of time. However sometimes things happen behind the scenes that are unforseen that cause the site to go down when you are moving it. I will try to post on Nutmeg Notebook facebook if any thing happens and we have to go off line when making the switch. Also for those of you who still follow me from the days before I started eating vegan I will not be keeping the recipes that contain animal products. I don’t want to promote eating the animal products and no longer feel good about having those recipes on my blog. I encourage you to print off the recipes that you like so you will have a hard copy of them. Many of you know that our daughter is pregnant with twins and we are getting excited about their arrival. Twins usually come early so really it could be any time in the coming weeks. We are so excited to meet these two babies and hold them in our arms. We will be very busy once they arrive helping care for everyone so blog posts and videos will be put on hold. Being grandparents is an amazing phase of life and one that we are thoroughly enjoying and participating in. Previous Post: « Batch Cooking in August! Great post, Tami! I love seeing all of the Holland Mill Bowl products you use. I love my chopping bowl, and wasn’t aware that they have cutting boards too. So pretty! Best of luck in your transition to a new website, and of course with the twins! Hugs to all of you! The cutting boards are lovely Colleen. Love all of their products – such beautiful quality. I love the smaller 9 inch cherry wood bowl. It’s the perfect size to hold citrus in. This recipe looks great! I sometimes add hummus to my salsa and make a nice creamy dressing for the salad or over a potato. Best of luck to you and your family for the twins arrival. Such an exciting time! I love hummus mixed in with my salads too! It makes it so creamy! Thank you for nice comments and well wishes!